The royal Fab Four are back together again. Yes, we're talking about Meghan Markle, Prince Harry, Kate Middleton and Prince William. The Duke and Duchess of Sussex and the Duke and Duchess of Cambridge reunited on Tuesday at a special event honoring the men's father, Prince Charles, in celebration of the 50th anniversary of his investiture. The now-70-year-old heir apparent was created the Prince of Wales at 9 years old in 1958 and formally invested with the title in July 1969. The event took place inside Buckingham Palace, where Charles was joined by guests including Prime Minister Theresa May, Game of Thrones star Owen Teale and Welsh rock band Stereophonics, who received support from the Prince's Trust years ago. 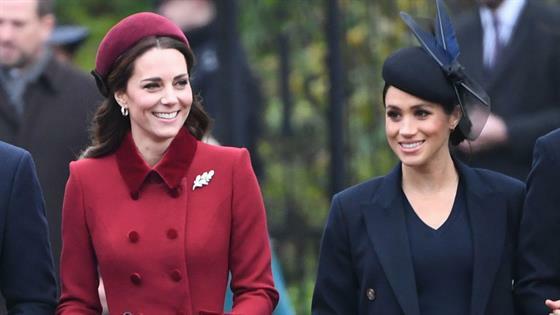 Perhaps the most anticipated guests for the public, however, were sisters-in-law Meghan and Kate, who have not been seen together publicly since attending the customary Christmas Day service in Sandringham late last year. Along with their famous husbands, the ladies were dressed to impress while keeping with their own style. The mother of three opted for a mint high-neck, over-the-knee dress accented with buttons up the neck with long, billowy sleeves. Meanwhile, expectant Meghan donned a shimmering brocade dress featuring a floral print and topped with a white coat. While the two appeared to be friendly at Christmas as they were spotted chatting and sharing a smile, Meghan and Harry reportedly were not at Kate's 37th birthday celebrations in January, though it was suggested they might have been on a holiday vacation. When Markle jetted to New York City for a baby shower with close friends, Middleton was nowhere to be seen, reportedly because she was on a secret, snow-filled holiday with her family. There have since been unconfirmed claims that the future first-time mom will also enjoy a gathering in England in celebration of her little one, which Middleton may attend or even host. Prince Harry and Meghan's first son or daughter isn't the only change coming for the royal family as of late. A source told E! News last month that William, who is second in line to the British throne, and Harry are set to split their household within weeks, echoing a Sunday Times report from October that the two were "considering a formal division of their joint royal household, which is based at Kensington Palace, and the creation of separate courts to reflect their increasingly different responsibilities." Back in November, Kensington Palace confirmed the Duke and Duchess of Sussex would be moving into Frogmore Cottage early this year "as they prepare for the arrival of their first child." However, their official offices will remain at Kensington Palace, which still serves as William, Kate and their children's London residence.